Cheese and chocolate. Chocolate and cheese. Mmmm..... People might think the combination is a bit weird, but not me. They're both dairy-based and no one bats an eyelid when someone serves up a wobbly chocolate cheesecake but I am regarded as strange when I blob a piece of fluffy goat's cheese onto a square of dark chocolate for a quick kitchen treat. I still don't get Cheddar and chocolate, and even less Stilton and chocolate, made fashionable by the likes of chocolatier Paul A. Young. To me, they just taste like two completely different things - they don't mingle to create one unique flavour. Maybe I'm using the wrong Stilton. Or chocolate. But there you go. 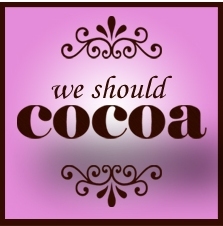 This month's theme for the We Should Cocoa challenge, run by Choclette of the Chocolate Log Blog, is cheese. And since I had some success earlier this week with my Monster High Cake Pops I thought I'd make some white chocolate cake pops - bound together of course, by soft cheese. I love these, and since I found out how to make them I can't stop. I always use a shop-bought Madeira cake - this gives such a lovely sweetness I think, and they're always a bit more stodgy, so I find they stick together better than home-made cake crumbs. Plus, you don't have to wait for them to cool (bonus). Mix the cake crumbs and the soft cheese together to make a slightly sticky mixture. Form into balls with your hand, or use an ice cream scoop - and poke in a cake pop stick. Lay on a tray lined with greaseproof paper and repeat rolling and spearing until they're all done. Slide the tray with the cake pops on into the freezer for 30 minutes. While the cake pops are freezing, gently melt the white chocolate in a bowl over a pan of simmering water. When the 30 minutes are up, take out the cake pops and drizzle and swirl over spoonfuls of the white chocolate. The chocolate will set pretty much as soon as it touches the freezing cake mixture. I like to swirl them up so they make little truffle shapes, with the chocolate a bit thicker than usual. I also covered some of them with pink icing and then drizzled over the white chocolate to create a pattern. Leave to dry fully in a mug or on a sheet of greaseproof paper. What do you reckon? Do you like chocolate and cheese? I often use shop bought cake for cake pops - I just bring myself to crumb up a specially baked effort to do them. Usually I mix mine into balls with buttercream so good to hear it works well with Philly. Great Sarah, thanks for taking a look! It's so much easier to use a shop-bought cake for these, glad you do it too! Glad to hear you are endorsing the goat's cheese and chocolate combination, although much to my shame I still haven't tried it and feel I should have done something with it for this challenge. My one experience of cheddar and chocolate has not been a particularly good one. Your cake pops look lovely and I bet they taste really good with cream cheese. I hadn't thought of that as a binding agent and have used buttercream so far - that could well be about to change. Thanks for putting these forward to WSC.